Sometimes you've worked up an appetite and simply can't stomach cooking at home. That's what happened for us today after heading out cycling. A cold and rather damp morning and a lack of wanting to stay at home lead to us saying "Lets go out for some Sunday lunch". The toughest question was where to go. Usually at the spur of the moment we'll head up to the Woodthorpe Top, a JD Wetherspoon pub but one we've pretty much over indulged over the last year. 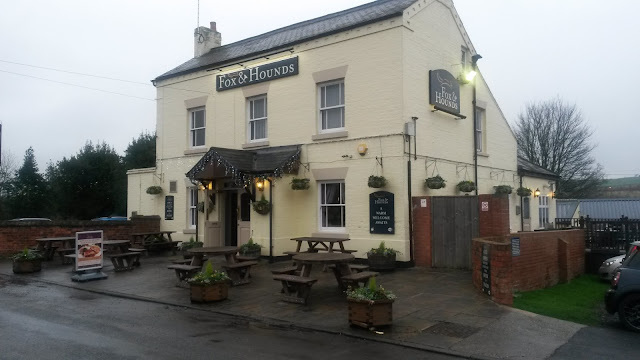 We wanted a good hearty meal so the Fox and Hounds at Blidworth suddenly became a good idea as from experience their food is good and their portion size enough to satisfy even the hungriest of cyclists appetite on a Sunday afternoon. We've been visiting the Fox and Hounds for a good number of years although surprisingly haven't actually put together a review for the blog. Sometimes at takes a rainy Sunday afternoon trip for us to highlight what we like about a place as not everywhere we go gets onto the blog. 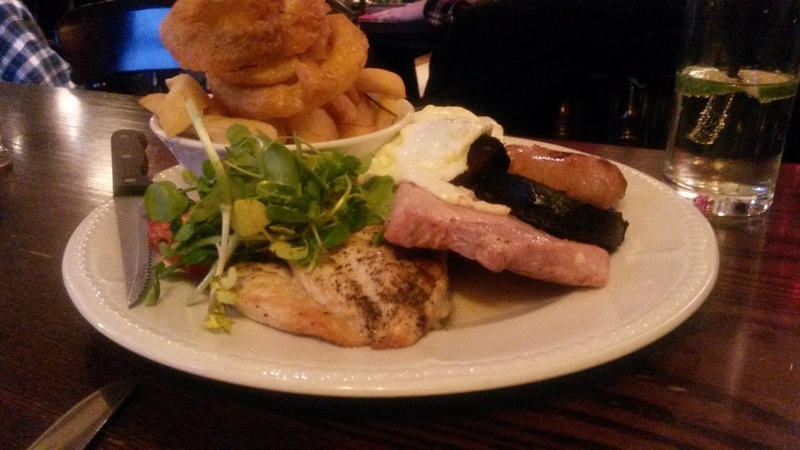 One of the reasons we like to head to the Fox and Hounds is their portion size. Their plates have a unique ability to satisfy that seems to have been lost for many a gastropub. With many a persons thoughts being that "a good meal is a big meal" the Fox and Hounds scores well. Yet from our experience they haven't let quality slip in favour of full plates. 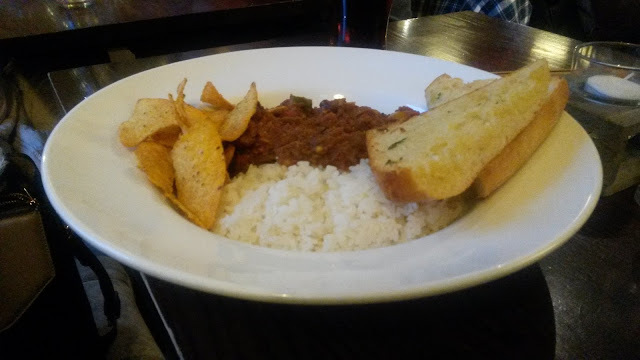 Meaty and wholesome yet not at all fatty the Hot Chilli Con Carne (£10.75) came piping hot served with a carbohydrate rich selection of garlic bread, fluffy white rice and nachos. The garlic bread was lovely and soft from a ciabatta roll, the rice nice and fluffy and the nachos of the premium brand taste variety. The Chilli itself was flavoursome and Moorish. With plenty of beef mince but without that fatty film that can sometimes develop and put you off. Classed as a 3 chilli heat rating it wasn't something you would need copious amounts of water to wash down (or beer) but at the same time you weren't left asking for more heat. The heat was slow burning with a few mouthfuls eaten before the heat began to build although never hit the intolerable heat point. We would have almost eaten a second portion if we weren't full up from the first. The Big Grill (£19.95) is a meat lovers paradise. Featuring a 5oz Rump Steak cooked to your preference, a 5oz Gammon Steak, 8 oz Chicken Break, hearty Pork Sausage. All this meaty goodness with a generous sized slice of black pudding, a couple of flat cap mushrooms, grilled tomato, hand-cut chips and salad. The price is high but what you get is a big grill. A veritable carnivores feast the steak, ordered rare came out rare, the chicken breast was lovely and moist, the gammon cooked as gammon should be and with a whopper of a pork sausage that would leave other sausages feeling inadequate the protein powder was evident, whilst well needed to help recovery from today's cycling efforts. Alongside the meat the black pudding was beautifully flavoursome, whilst the hand cut chips were crispy and clearly just from the deep fat fryer moments before serving. Definitely what anyone hungry would wish for from their mixed grill. We had a lovely meal at the Fox and Hounds, Blidworth. We've been back time and again so we know by now what to expect. There's lots of choice on the menu and always a compact yet well catered selection of ales on the bar too. We've always said we'll go back at some point for Friday night Fish and Chips although have been warned that you need to book for this.